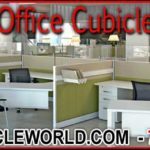 In many cases, it is the interior of the cubicle that is customized more than the exterior. Take, for instance, our exampled of the 6×6 office cubicle. We often buy these use and completely refurbish the surfaces to restore their original appearance. When a new order arrives, we will build out the interior with storage systems, desk areas, and windows specific to your individual requirements. Custom does not necessarily mean more expensive. Custom cubicles can be built quite cost competitively if we use refurbished panels, desk systems, and doors. New cubicles, by their very nature, carry a higher price point. Part of this higher cost derives from the exceptional warranties that many manufacturers offer with various lines of cubicles. With our refurbishing and customization processes, we can build you a highly efficient and comfortable workstation without exceeding budget tolerance. This process can also be used to build larger cubicle systems like the ones mentioned in the video. Cubicle offices like these can return tremendous savings to you in the future when you move into new office space. You won’t have to spend much money on building sheet rock walls if you have have private cubicle offices that we can simply disassemble and reassemble in your new location. Room utilization is a factor in cost. Remember, you are paying for every square foot in that office. You only need a certain amount of floor space to walk around. Everything else should used for either task completion, storage, or technical infrastructure. If you go with standard office furniture, or even basic cubicles, some of your floor space will be wasted. If you add the rental cost of this wasted space to the cost of your furniture, you will often find that what you thought was a bargain buy is actually more expensive than a system consciously designed to support production in every part of your office. Cubiture warranties our custom cubicles for a period of 1 year for craftsmanship and labor. We also have affordable repair programs for out-of-warranty programs. Call Us For A FREE Medical Used Office Cubicle Quote 713-412-3090.